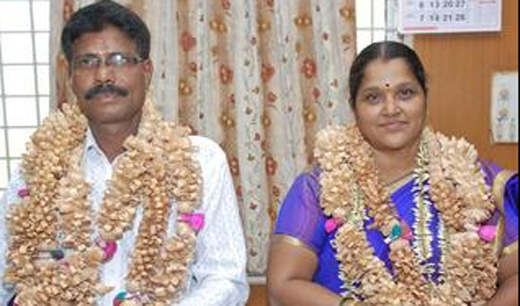 Udupi, May 7, 2016: Nalini Pradeep and Rajendra P are the new President and Vice President respectively of the Udupi Taluk Panchayat. Both were elected unopposed on May 6, Friday. The post of President was reserved for a General Category lady candidate while the post of Vice President was reserved for general category. The opposition Congress had not fielded any candidate and the Assistant Commissioner P Aswathi who was the Election Officer declared Nalini and Rajendra as the winners. The Udupi Taluk Panchayat has a total of 41 members including 27 from the BJP while 14 members are from the Congress. The new President represents Neelavar ward while the Vice President is from Nidambur Ward and both are first time Panchayat members. Speaking after being elected to the top post, Nalini said her top priority was to solve the drinking water problem and provide good roads. She also assured to work by taking all members into confidence. The new Vice President of the Taluk Panchayat, Rajendra has the experience of serving as Vice President and President of Ambalpady Gram Panchayat. A hearty Congratulations to both on being elected.